For other mosques with similar names, see Jameh Mosque. Jame Mosque of Qazvin (Persian: مسجد جامع عتيق قزوین‎ – Masjid-e-Jameh Atiq Qazvin) is one of the oldest mosques in Iran, and is the grand, congregational mosque (Jameh Mosque) of Qazvin, in Qazvin Province, Iran. The oldest part of the mosque is said to have been constructed by the orders of Harun al-Rashid in 807CE. 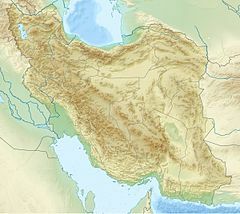 Later additions were made, the last being during the late Safavid era. The double layered main dome of the mosque is from the Seljuk era, and is locked to the public. It houses some precious examples of relief calligraphy from medieval times. Renovations have also been carried out on many sections of the mosque. Part of the complex caught fire on 28 January 2013. Half of the complex was burnt and destroyed by the fire. This article about a mosque or other Islamic place of worship in Iran is a stub. You can help Wikipedia by expanding it. This page was last edited on 4 March 2019, at 12:25 (UTC).